At this point, I’ve written something along the lines of ‘another week, another new Fortnite weapon’ so many times that the very sentiment has lost all meaning, but here we are again. And this time, it looks like Epic is basically encouraging its players to just straight-up shoot fireworks at one another. The new weapon, Bottle Rockets, hasn’t been officially announced yet, but the news comes from serial leaker and dataminer Lucas7yoshi on Twitter, so I’m pretty confident in its accuracy. From Lucas7yoshi’s tweet, which you can check out further down this article, you can see what looks to be a mounted fireworks launcher. The tweet appears to have sourced the new weapon’s description from the ‘message of the day’ screen, which pops up as players load in to reveal upcoming content. For the Bottle Rockets, it reads “loud, bright, and dangerous! Warning: do not light indoors.” From the image above, I’d suggest that it’s similar to the pre-existing turret, which you need to place and then manually fire. Given that this appears to just be a bunch of fireworks, however, my guess is that you’ll be doing more explosive than ballistic damage, and the whole “do not light indoors” suggestion implies that they’ll be powerful, if a little scatter-shot. 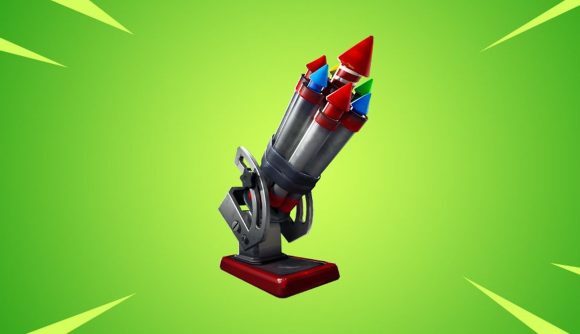 We don’t currently know when the Bottle Rockets will make it into the game, but given they’re yet to be officially announced, I wouldn’t expect Epic’s trademark speedy turnaround. It’s quite possible that the weapon will be available later this week, but I’d be surprised if we see it that soon. Fortnite put on a firework show of its very own over the weekend, which showed up at the end of Marshmello’s ten million-strong in-game concert. The DJ performed in Pleasant Park on Saturday night, in what some are describing the biggest live concert ever.